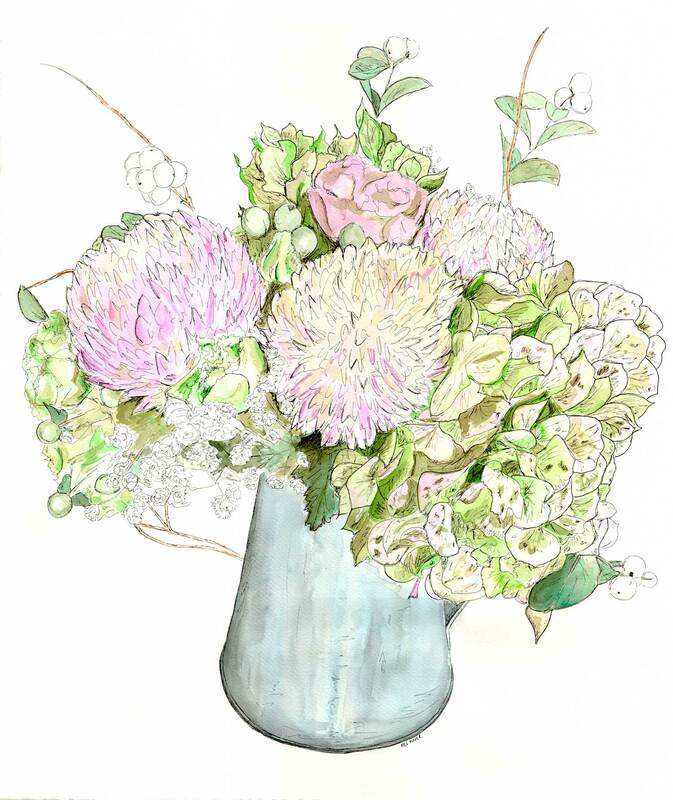 ‘A Joyful Bunch’ was inspired by a flower arrangement by local florist Dianne from A Joyful Bunch. I just loved the arrangement and with her permission made it into a painting using acrylic ink and pen on watercolour paper. I dropped this painting into Starlight Jewellery and D’Vine Art today and within 3 hours it was sold! Thanks Dan. Dan has recently taken over the business and has some wonderful plans for the future of the shop. Make sure you drop in and say ‘hi’, check out the other wonderful things in store and maybe even take something home. I have more art on display in store with more to be added soon. 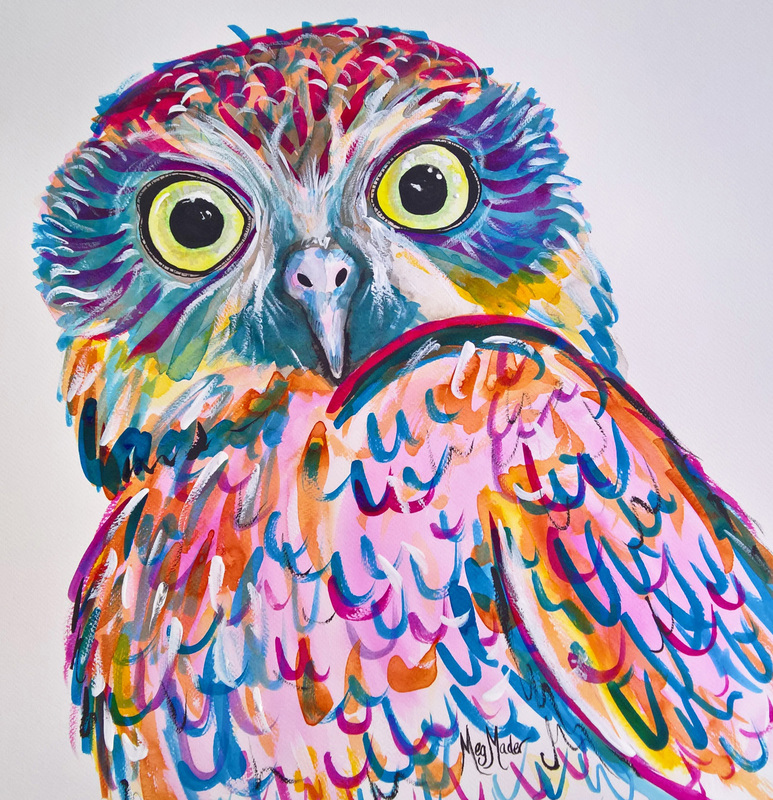 Owl with Attitude’ has been sold! I recently listed this painting on Bluethumb and before long it found a new home in the ACT. This was a wonderful painting to create. It is big, bright and definitely has it’s own character. 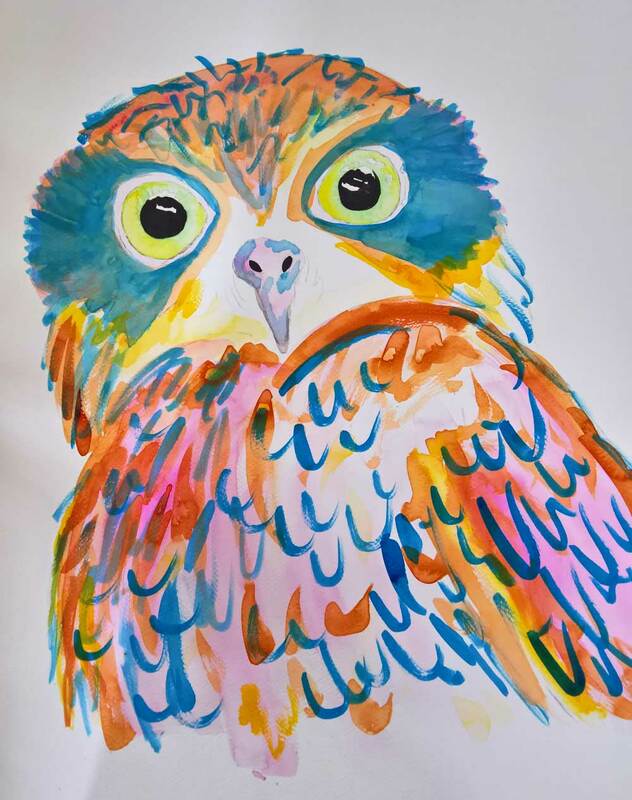 What started off as a normal(ish) brown owl suddenly became this multi-coloured madness. The painting definitely led me and not the other way around. 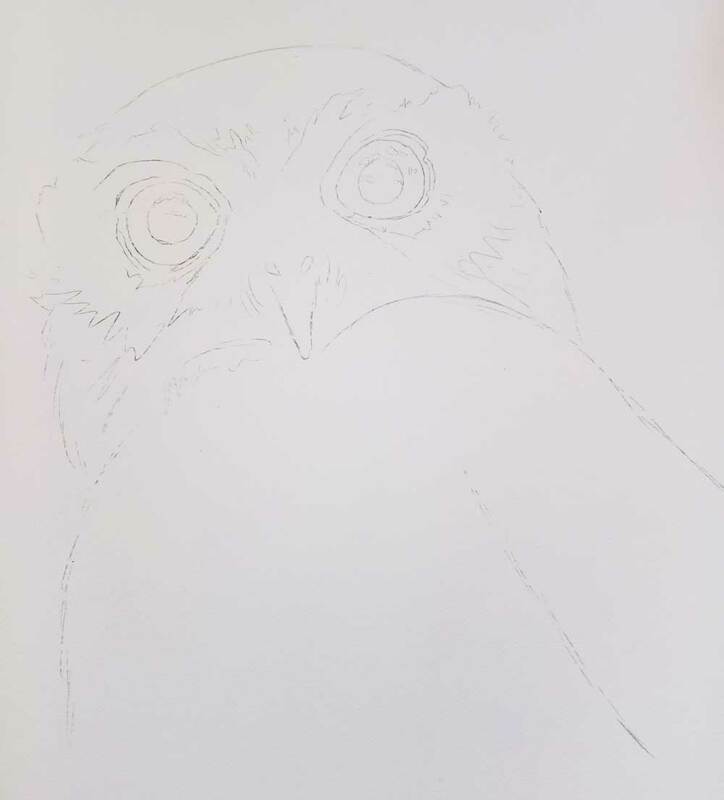 Here is my new painting ‘Owl with Attitude’ and the process of how it progressed. This is one of my larger paintings at 48cm x 48cm and is currently available on Bluethumb. This was so much fun to create as I was in a bit of a quirky mood at the time and let the painting lead me. 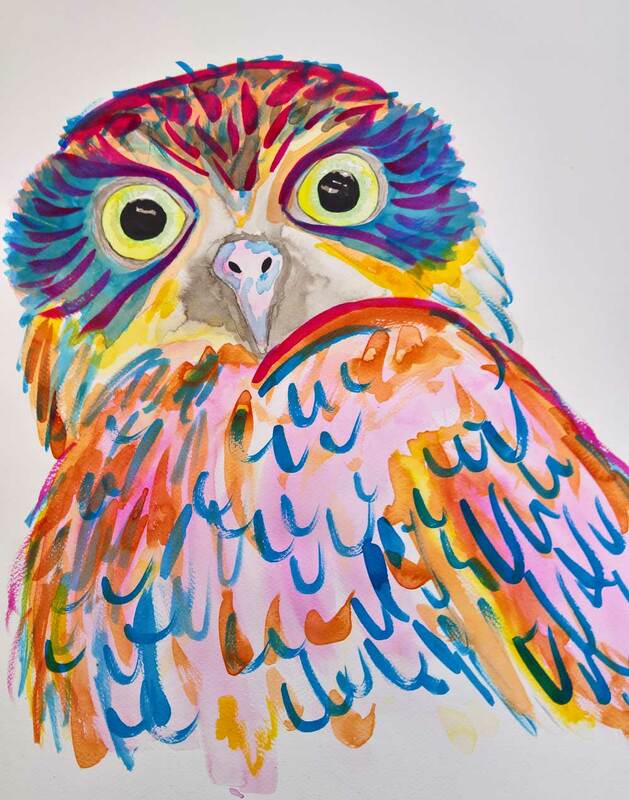 The result…a rainbow owl. Fantastic! 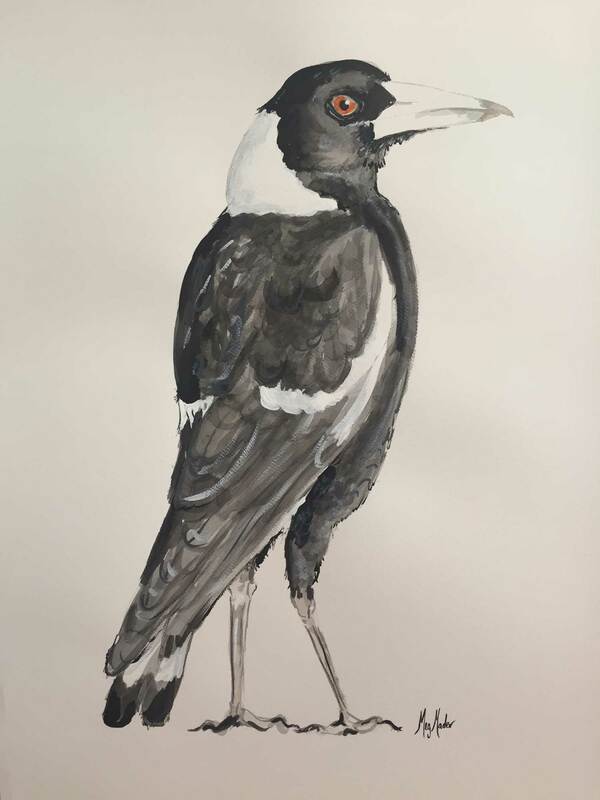 I have been working on a magpie painting with an idea in my head of how it should look. It was a disaster! Nothing seemed to be going right with my painting but after some encouragement to continue, I went in slightly different direction and was really happy with the result. After posting the painting on Facebook, it sold that same night. Ah…the magic of social media! Two of my artworks were on display during the month with the larger one, ‘What the…?’, selling before the opening event. It was very exciting to walk into the opening and see a red dot beneath my painting. 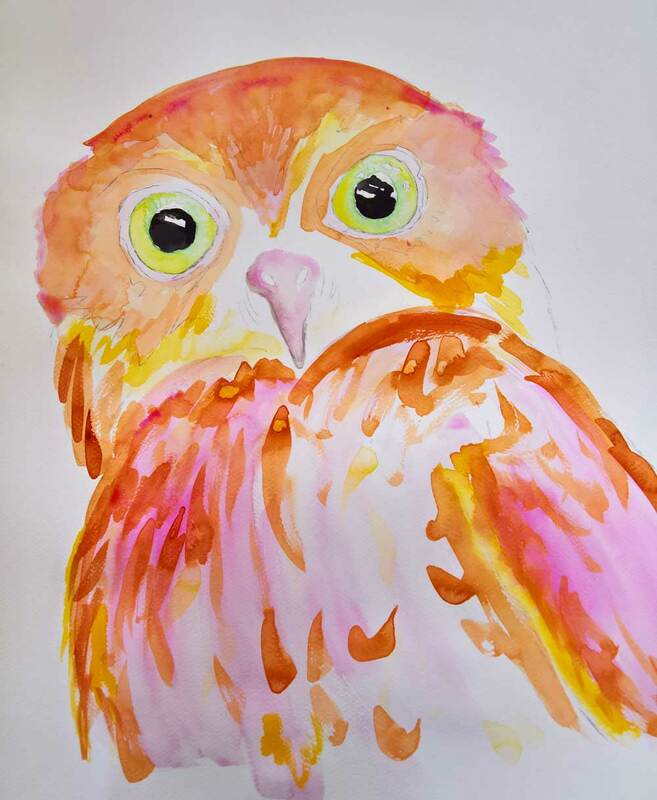 The Zonta Club of Clare and Districts Inc. has requested to hear the story of my artistic journey along with Graciela Dorey, another local artist. Zonta International is a world wide organisation of executives in business and the professions working together to advance the status of women through service and advocacy. The Journey Studio’s art group are holding an exhibition for SALA titled ‘Mini to Massive’ which will run for the whole of August. The official opening will be held on Saturday 1st August at 2pm at Vine Art Studio and Gallery at Leasingham. There will be nibbles and some fantastic local wine generously donated by Claymore Wines. The art group have worked together dividing up images into smaller (mini) sections to make some interesting artworks made up of various styles and interpretations to recreate the original picture. Along with these three collaborations there will also be individual pieces of various styles and subject including jewellery from two of our talented members. My current favourite medium is Matisse artist quality acrylic ink. The colours are vibrant, can be used as a wash to slowly build up colours or, for intense colour, can be used undiluted from the bottle. 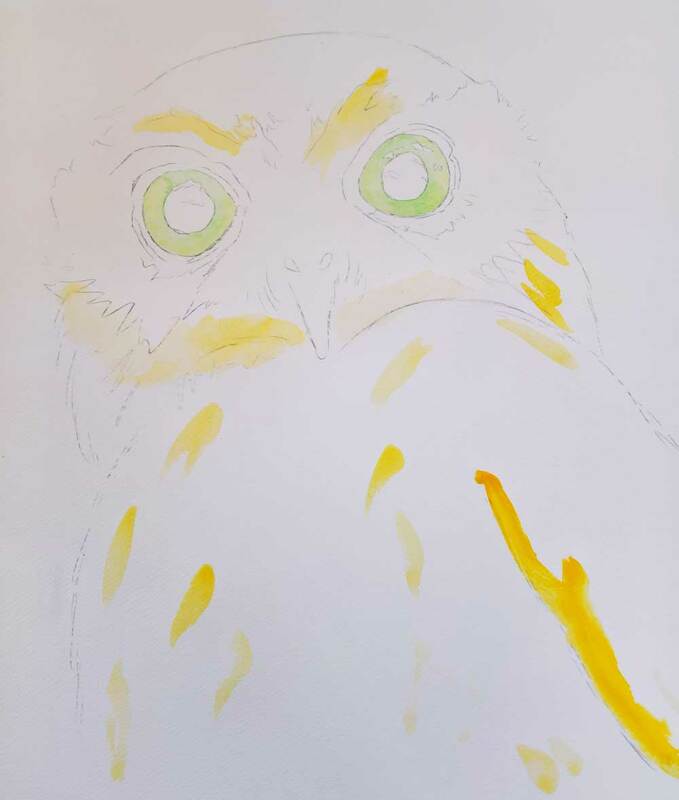 Here is my current work in progress – ‘Edmund’. 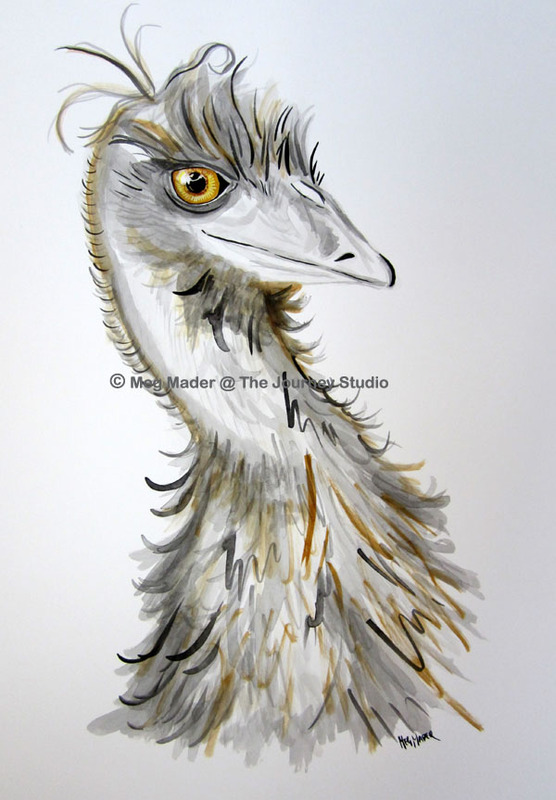 As a rule the eye is always painted first in my paintings of birds or animals as they have the most detail in the painting. 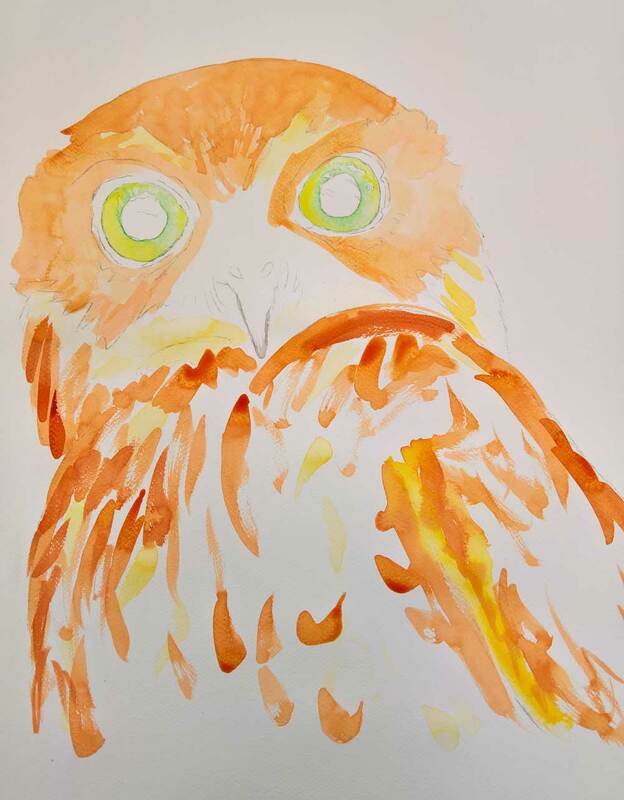 The rest is then lightly painted in with a wash with the colour slowly getting added as the layers build up. At this stage of the painting Edmund looks a bit messy and unrefined. More layering is needed which is best to do slowly so not to overdo it. When I’m happy with the overall shape I start adding some darker colours in my sketchy style to suggest detail. This is the really fun part as I get to just let go and splash the ink around. Here is the completed Edmund on the right. All ready to go in a nice white frame. He is off to the Clare Rotary Art Exhibition where he will be available for sale. The exhibition will run from 15-21 May. 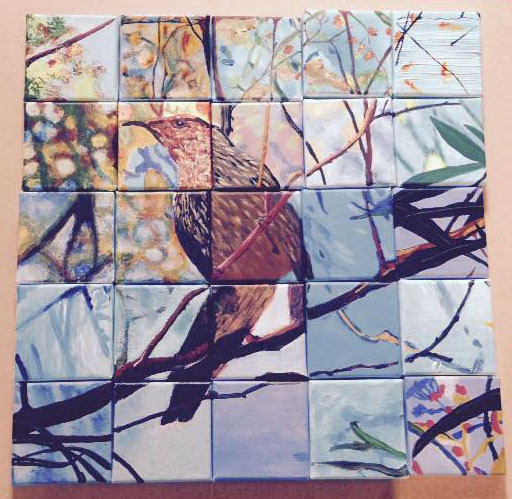 For the second year in a row, Meg Mader will be demonstrating her art as one of the artists in residence at the Clare Rotary Art Exhibition. 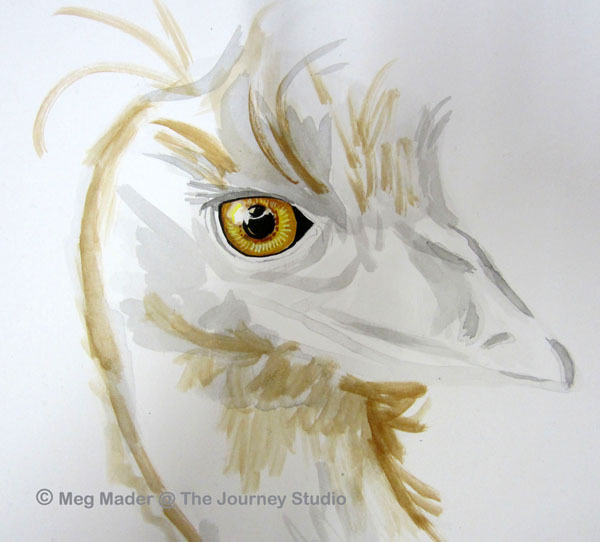 The artist in residence will be available to the public to discuss their personal process and style, so make some time to come along and meet with Meg. 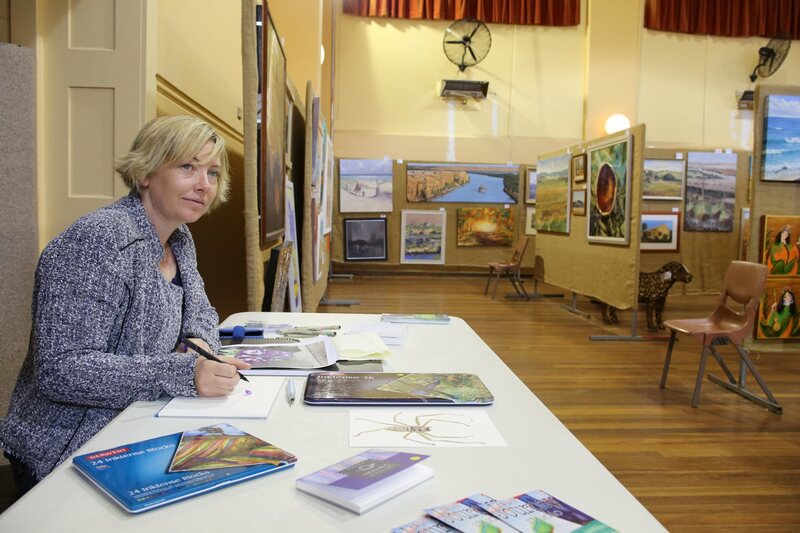 The annual art exhibition is held in conjunction with the Clare Valley Gourmet Event (see Clare Valley Regional Tourism site for details). 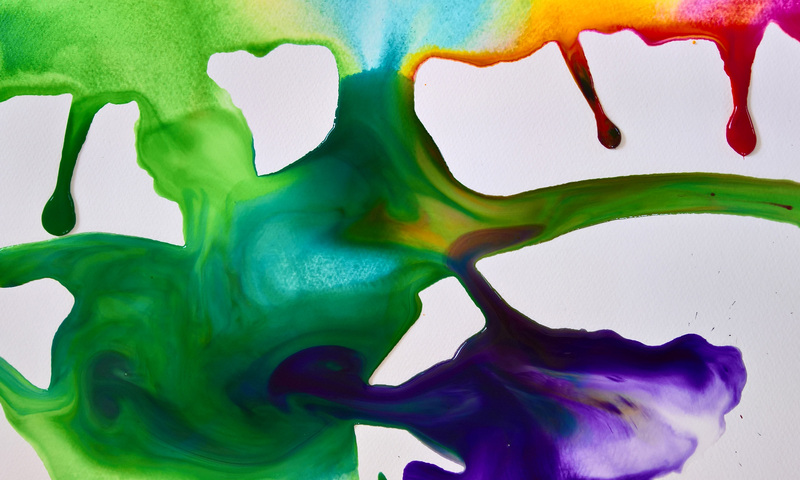 Artists Australia-wide have entered this competition. The value of prizes exceeds $15,000 over nine categories. 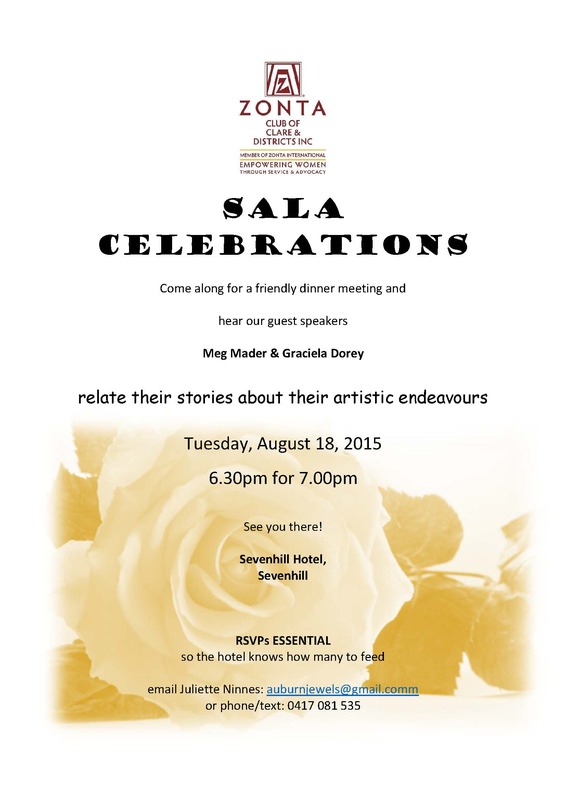 See the Rotary Club of Clare for more information about the exhibition. 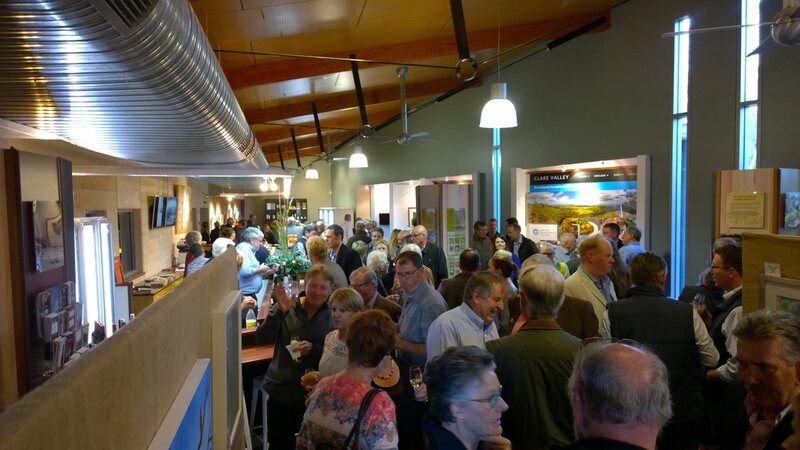 The reinvigorated and rebranded Clare Valley Wine Food and Tourism Centre reopened at the southern entrance to Clare on the 24th of April 2015 and with it the VAPAA exhibition featuring local artists from the mid North of South Australia. 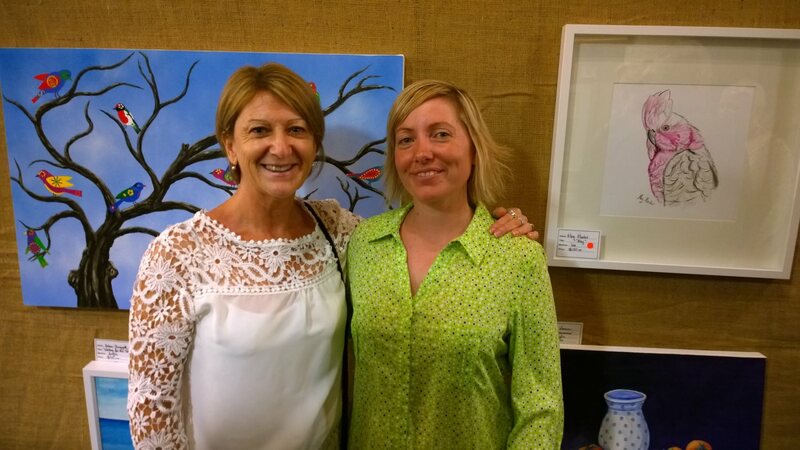 Meg Mader from The Journey Studio was invited to exhibit and presented four painting at the opening. Locals turned out in force to ensure the success of the opening that has been brought together by the consortium consisting of the Clare Valley Winegrape Growers Association, Clare Valley Winemakers Inc, Clare Valley Cuisine, Clare Valley Business and Tourism Association and Visual and Performing Arts Association. 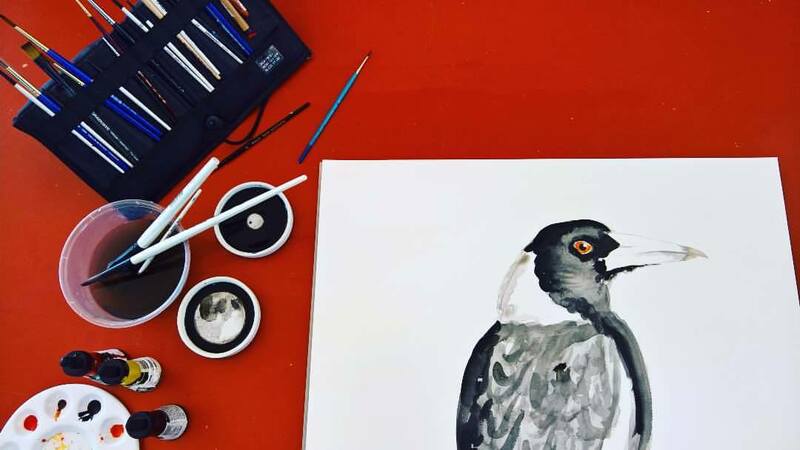 Visitors and locals alike are encouraged to come down and take a look at what is on offer including information about places to go and things to do in the Clare Valley, local gourmet produce, wines and wineries and of course the visual and performing art on offer. 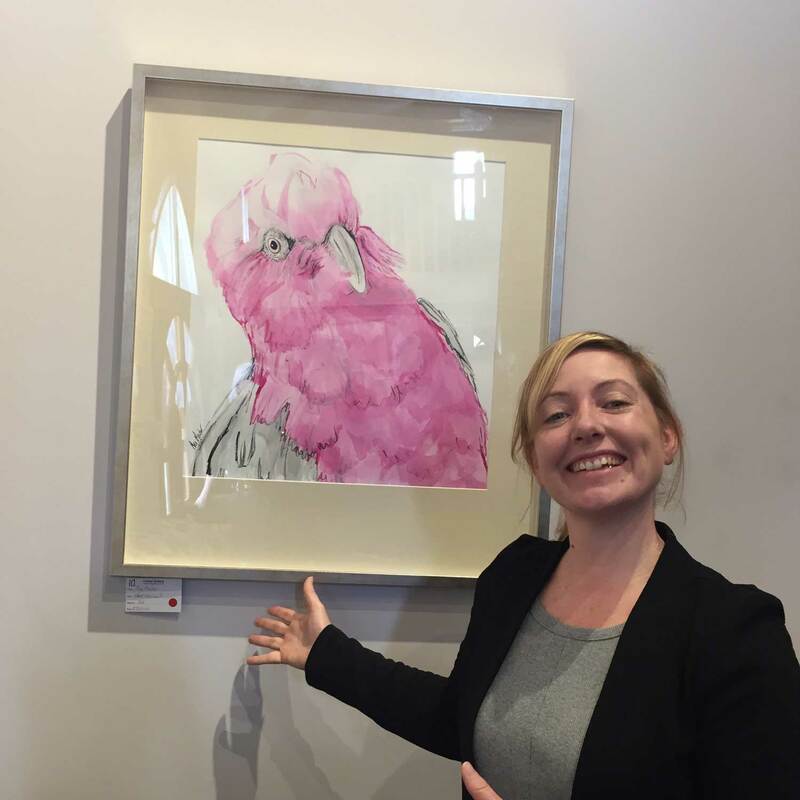 Just to top off a great event, all of Meg’s paintings were sold at the opening!